The Honored Alumni Award is the highest honor bestowed upon Cal Poly alumni by the university’s Alumni Association. The award was established more than 40 years ago to provide recognition for outstanding graduates and former students of Cal Poly. Mike Selfridge (Economics ’89) has been named the 2018 Orfalea College of Business Honored Alumnus. As Chief Banking Officer for First Republic Bank, and as a member of the bank’s executive management team, Selfridge is responsible for the company’s private banking, business banking, and cyber & information security activities. Previously, Mike served as First Republic’s Chief Operating Officer and as its first Chief Risk Officer. Selfridge began his career working for HSBC and Wells Fargo before moving into an 18-year span at Silicon Valley Bank, where he held a number of executive management positions, including head of U.S. Regional Banking. He has long been involved in governmental and non-profit sectors as well, serving on the advisory board for the Export-Import Bank of the U.S., and spent nearly two decades on boards for various non-profit organizations. Currently, he serves on the board of directors for Catholic Charities in San Francisco, Marin and San Mateo counties. 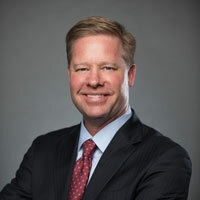 Along with his Cal Poly degree, Selfridge holds an M.B.A. from University of San Francisco and is a graduate of the Harvard Business School Advanced Management Program. Orfalea College of Business initiatives have remained a priority for Selfridge, who has consistently supported the Center for Innovation and Entrepreneurship, hosted students for industry tours, spoke on campus as an Executive in Residence, and more.